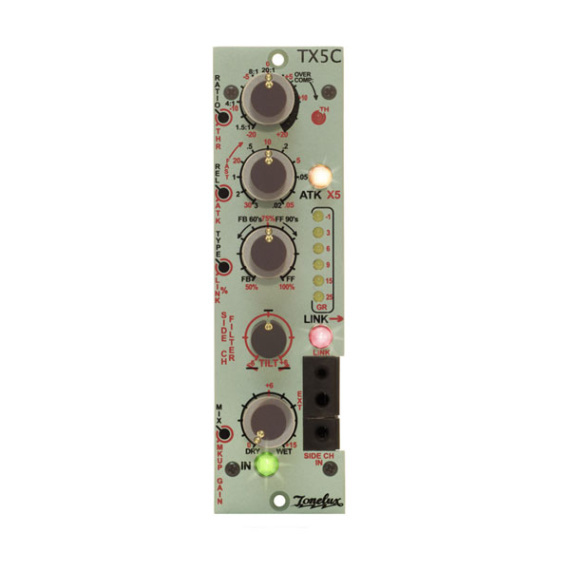 The TX5C is the 500 series module that addresses the complex issues with compression. 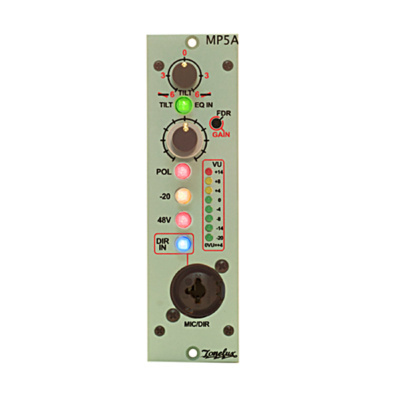 With the ability to do in-module parallel mixing of the dry signal and the compressed signal, the engineer can now enjoy the parallel or “side chaining” of an instrument with itself and come up with the perfect blend of the original and compressed signal without the problems associated with in-the-box latency. In addition to the Input/Compressor MIX knob, the TX5C has many other unique features not found on any compressor made today. The ability of being able to switch between Feed Back and Feed Forward compression is something that is not new to Tonelux. 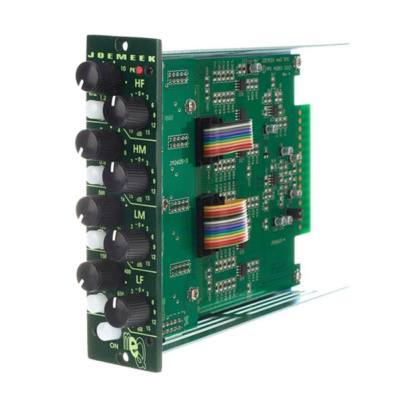 With the TX5C, he decided to take it one step further by allowing the ability to fade between Feed Back compression and Feed Forward compression with the TYPE control. This feature gives the engineer the freedom to combine the smooth nature of the Feed Back type of compression with the agressive effect of Feed Forward compression. 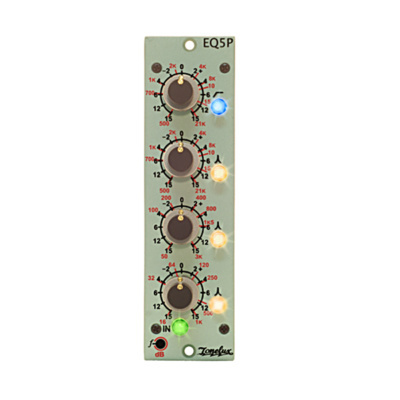 In addition to the FB-FF Type control, the TX5C has the ability to over compress with the RATIO control, which allows compression ratios from 1.5:1 to 20:1, and then beyond, with the “OVER:” ratio settings that cause the compressor to reduce the gain at a higher ratio than the gain is going into it. 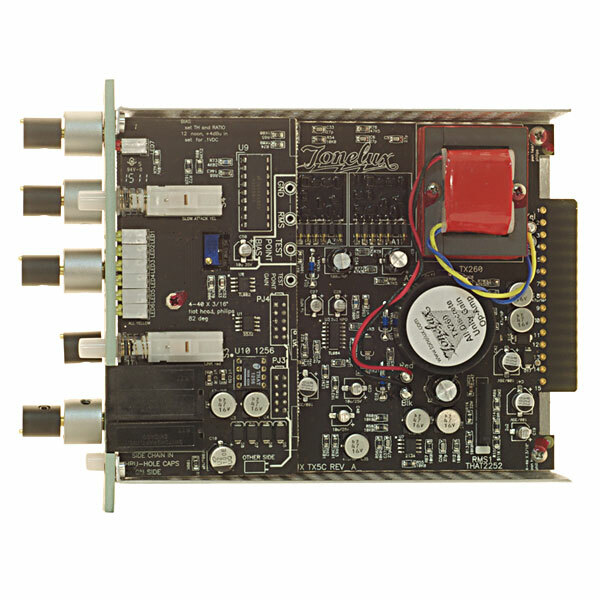 This means that the ratio control allows the compressor to compress an increase in signal of 10dB with a gain reduction of up to -8dB. If the signal goes up 10dB, the output will go DOWN 8dB. This becomes useful when taking a pre compressed snare and by adjusting the Attack, and setting the Ratio in the OVER:area, you can actually recover the initial impact peak of the snare. This, with the MIX control, can then be blended back with the original “flat” snare and you now have a dynamic snare again, but with a very controlled peak. The TX5C also inserted the now famous “TILT” control into the side chain of the RMS detector, so you can increase the highs and decrease the lows going into the RMS detector, virtually eliminating the effects of pumping because the Detector is seeing a more uniform distribution of energy across the spectrum instead of a bass heavy signal like most compressors.